Welcome to our website! We’d like to applaud you for finding a great vehicle for your needs by checking out what the 2019 Toyota Highlander has to offer. We understand you’ll need some more information to figure out if this crossover works for your daily tasks in the Avon, Indianapolis, or Plainfield areas, so we’re inviting you to download this free guide. 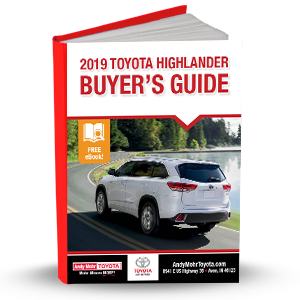 By downloading this free eBook, you can learn about the Toyota Highlander to determine if it’s the right SUV for your driving lifestyle. At Andy Mohr Toyota, we’ll help to answer all of your questions about this crossover SUV and help you find the best vehicle for your needs!